Virginia Park Lodge, Co. Cavan, Ireland. September 2018. A romantic suite with hand-torn, cotton paper, a moody gouache painting of the lakeside backdrop of Co. Cavan and a letter layout with calligraphy names to add a personal feel for their guests. With guests coming from all over, we created a website on Squarespace with gouache colorscape backgrounds to complement the rest of the artwork. Their digital Save the Dates with a watercolor of a photo Marie-Claire took on Boulder Rock in the Catskills, the day Shane popped the question. 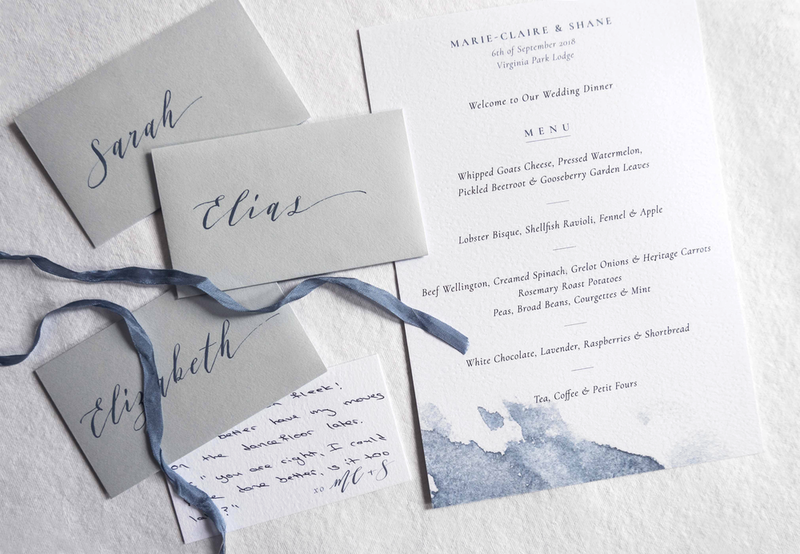 Menu with dusty blue watercolor wash. Calligraphy placenames in tiny envelopes with handwritten notes for each guest…this couple really thought about the little details.